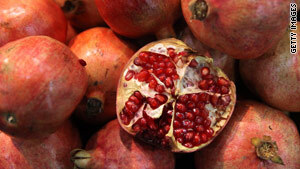 Fresh pomegranates are at their peak this time of year, so use their seeds to add taste and a unique accent. (CookingLight.com) -- Many foods we eat during the holidays have nutrients that may help prevent disease. "There's an added benefit to obtaining these vitamins, minerals, and phytochemicals from a variety of foods, since they work synergistically to create positive health effects," says Melissa Ohlson, M.S., R.D., a spokesperson for the Cleveland Clinic Heart Center. This root vegetable (especially the dark-fleshed orange variety, typically called a yam) has a high amount of potassium, fiber, and the antioxidant beta-carotene. "All three have been associated with a lower risk of cardiovascular disease," Ohlson says. Enjoy them year-round: Use in place of pumpkin or banana in recipes for muffins, pancakes, and breads, says Dana Jacobi, author of "12 Best Foods Cookbook." This Chinese fruit is one of the most potent sources of antioxidants, such as polyphenols and anthocyanins, which may help reduce the buildup of plaque in arteries, lessening the risk of heart disease, says Ohlson. She adds that they're also a good source of potassium, fiber, and vitamin C.
Enjoy them year-round: Fresh pomegranates are at their peak this time of year, so use their seeds to add taste and a unique accent, garnishing anything from hot soups to cold salads and cocktails. To reap their nutrition reward all year, look for their intensely sweet-tart juice, syrup, or molasses, Jacobi says. High in compounds called tannins, cranberries have been linked to a decrease in urinary tract infections, gum disease, and some types of ulcers because of their antibacterial effect. "Tannins also may play a role in reducing the risk of heart disease and some cancers," Ohlson says. Enjoy them year-round: Since fresh cranberries are exceptionally tart, most recipes for sauces and relishes contain a lot of sugar, Jacobi says. You can reduce the amount by using sliced or chopped apples to add sweetness instead. Freeze these in bags for year-round use. High levels of fiber found in lentils may help reduce cholesterol levels and maintain blood sugar, while folate helps to regulate homocysteine levels, protecting the heart from disease, Ohlson explains. Lentils are a traditional New Year's food, especially in Italian, German, and Scottish cultures. Enjoy them year-round: Use them to add protein to soups and salads, Jacobi says. In addition to iron and magnesium, a cup of this beverage can provide you with twice the amount of antioxidants found in red wine and triple that of tea, according to a study published in the Journal of Agriculture and Food Chemistry. If you prefer these benefits in the form of a bar, try eating one to two ounces of dark chocolate containing at least 70 percent cocoa solids daily. Several long-term studies have found that this type of dark chocolate may help lower LDL (bad cholesterol) and increase HDL (good cholesterol). Enjoy it year-round: For a rich, creamy chocolate drink you can sip hot or cold, Jacobi recommends heating one cup of vanilla soymilk, one tablespoon of water, and two tablespoons of sugar. Just before it boils, whisk in two ounces of dark chocolate (chopped) and two tablespoons of Dutch-processed cocoa powder.